Primrose (Primula vulgaris) in flower at Fairhaven Woodland and Water Garden. Last weekend I visited Fairhaven Woodland and Water Garden in South Walsham, Norfolk. While there I saw plenty of primroses (Primula vulgaris) in flower. The primrose is native to Western and Southern Europe and cultivated forms are popular in gardens. During a field trip in Pembrokeshire as an undergraduate student I spent a couple of days studying primrose flowers. Wild primrose flowers are typically a pale yellow colour like those pictured above but white and pink forms are also seen. There are two forms of flowers, which look almost identical apart from the position of the stigma (female part) and the anthers (male part holding the pollen) in the flower tube in the centre. In “pin” flowers the stigma is positioned at the top of the tube with the anthers positioned halfway down. In “thrum” flowers the stigma is instead positioned halfway down the tube with the anthers at the top. Thrum flower type. The anthers are visible at the top of the flower tube with the stigma underneath about halfway down (not visible). Photograph by Magnus Manske distributed under a CC BY-SA 3.0 licence. Pin form. The stigma is at the top of the flower tube above the anthers (not visible). Photograph by Velella distributed under a CC BY-SA 3.0 licence. The two flower types were first described by Charles Darwin in 1862 (1) and he also observed that the pollen produced by the pin flowers was smaller than that of the thrum flowers. He performed a number of crosses (where he took pollen from one flower and placed it on the stigma of another) between pin-to-pin, thrum-to-thrum, pin-to-thrum, and thrum-to-pin flowers and found that the crosses between the different flower types were more fertile than those between flowers of the same type. Vertical cross sections of (A) “pin” flower and (B) “thrum” flower. Image from Devon Biodiversity Action Plan (click link for website). Both flower types contain nectar at the bottom of the flower tube to attract insects to mediate pollination of the flowers. Darwin thought that the reciprocal positions of the anthers and the stigma in the two flower types would promote cross fertilization. He suggested that when an insect visits a pin flower it inserts its proboscis (feeding tube) into the flower tube to feed on the nectar, and pollen from the anthers would stick onto the proboscis about halfway down. If the insect then visits a thrum flower the pollen already on its proboscis is at the right level to meet and stick to the stigma about halfway down the flower tube, leading to cross fertilization. At the same time pollen from the anthers at the top of the thrum flower tube is likely to stick to the top of the insect proboscis, the perfect position for cross-fertilizing the next pin flower the insect visits. 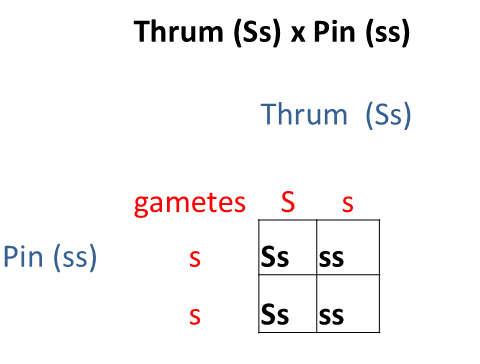 A punnet square showing the inheritance of the S locus in offspring of a thrum x pin plant cross. Each parent produces gametes (female egg, male pollen) that have one copy of the S locus. In the pin flower all the gametes will have a copy of the recessive s. 50% of thrum gametes will have the dominant S and 50% have the recessive s. The fertilization of eggs by pollen result in offspring (shown in black) with pin or thrum flowers in a 1:1 ratio. More recently, genetic studies have suggested that the genes responsible for the pin and thrum forms lie in a region of the genome called the S locus, with pin plants having two copies of the s allele (homozygous denoted ss) and thrum plants having one copy of the dominant S allele and one s (heterozygous denoted Ss) (2). The S locus is thought to be made up of at least three genes that are very close to each other on the chromosome so they are inherited together as one unit (linkage group) (3). When a pin and a thrum plant produce offspring the ratio of pin to thrum plants produced is 1:1 (1,2). Alongside the two forms of flowers, primroses have a “self-incompatability” mechanism in primrose flowers that stops the eggs being fertilised by pollen that is genetically identical. Therefore, the vast majority of successful pollinations in a wild population of primroses are between pin and thrum plants and so the ratio of pin to thrum plants should be about 1:1. 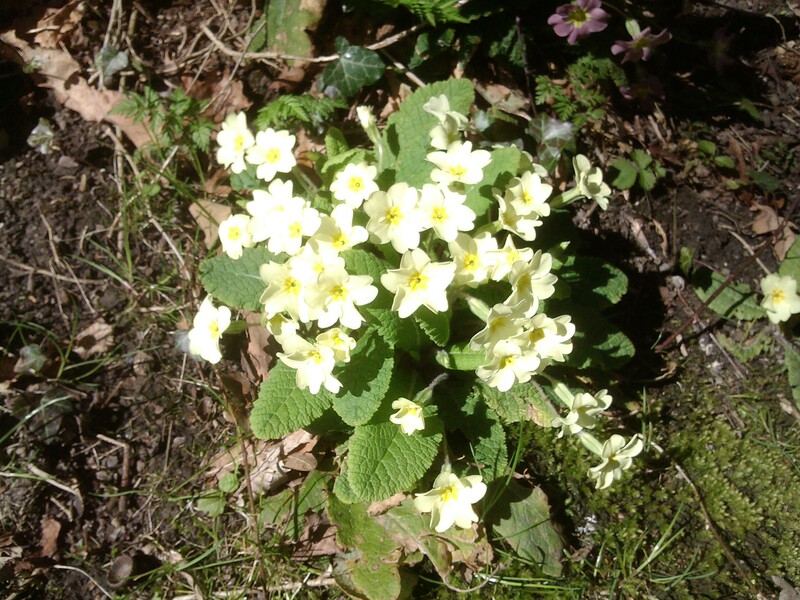 Next time you see primroses in flower take a look! 2. Crosby JL. Selection of an unfavourable gene complex. Evolutionary Ecology Research. 1949;3:212–230.